At the Arab League conference in Cairo, they said they were "surprised and discontented at the response". The Jyllands-Posten newspaper published a series of 12 cartoons showing Muhammad, in one of which he appeared to have a bomb in his turban. The Arab League's ministers council said the cartoons were an insult to Islam. The government's response "was disappointing despite its political, economic and cultural ties with the Muslim world", it added. Danish Muslim community leaders held talks with Danish Prime Minister Anders Fogh Rasmussen in July to complain about press coverage of Islam. At the time, Mr Rasmussen said he could not tell newspapers what to print - or what not to. Arab ministers also said they were unhappy that European human rights organisations have not taken a clear position on the issue. 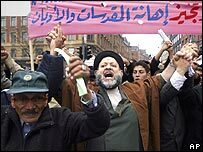 There have been street protests both in Denmark and in Muslim countries following the publication of the cartoons. The newspaper insists on freedom of expression and says it has the right to print whatever words and pictures it chooses. It said both the paper and the cartoonist had received death threats.